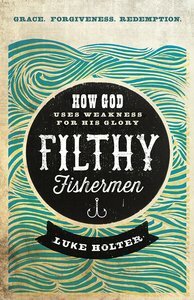 Filthy Fishermen is a book about the power of redemption. It will serve as a source of encouragement to anyone who has failed or thinks they've messed up so bad that God can't use them. God didn't choose those most likely to succeed; He chose the foolish and the weak-those who wouldn't be considered wise, mighty, or noble in the flesh. Jesus takes the underdogs and makes Himself shine through them. He'll take the filthy and make them fishers of men. Read the stories of real people, and the stories of numerous biblical figures who failed and failed again, yet were extravagantly redeemed and restored. It is not a "how to" book, but through the stories and teachings about grace, forgiveness, destiny, and faith, readers will see how to release the past and pursue all God has for them. No matter how great your failure God's destiny is always greater! Luke and Grace Holter are the ministry leaders of Prophetic Sheep Ministries. As an expert in real life issues, Luke Holter brings with him eight years of experience in church leadership; Luke's passion is to awaken people's hearts to an honest and open relationship with Jesus, and to give language to take on their destiny. Luke is a sought after conference speaker who moves in a unique prophetic gifting. Luke and his wife Grace are currently Apostolic Prophetic Leaders, and College Pastors at Fairmont Christian Center in Houston, Texas.